MIAC 50th Year Anniversary. Photo credit Haley Staffon and St. Thomas Men's Soccer. 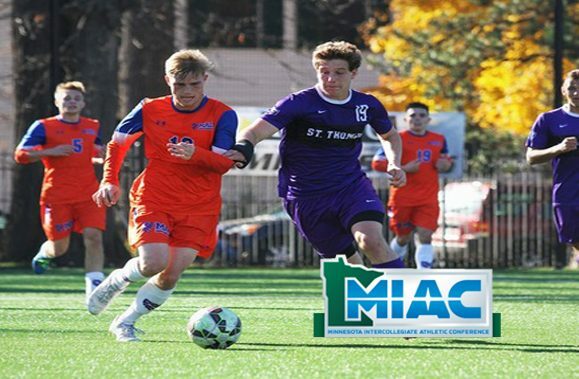 This is the second of a two-part series looking at the history of Minnesota Intercollegiate Athletic Conference (MIAC) men’s soccer, now in it’s 50th year, and a preview of the 2017 season. You can read part one here. The Minnesota Intercollegiate Athletic Conference (MIAC) kicks off its 50th season of men’s soccer Wednesday, Sept. 13, with 4 p.m. games featuring St. John’s at Concordia, Gustavus at Carleton, St. Mary’s at St. Thomas, and Bethel at St. Olaf, plus a 7:30 p.m. meeting between host Macalester and Hamline. Augsburg opens its MIAC campaign at 1 p.m. Saturday, Sept. 16, at Bethel. Agre took over as coach in 1974 and 1975 while attending medical school at the University of Minnesota. He led the Auggies to a pair of MIAC championships, the second of which was followed by a memorable NAIA playoff win over Wisconsin-Platteville in the snow at Lake Nokomis. 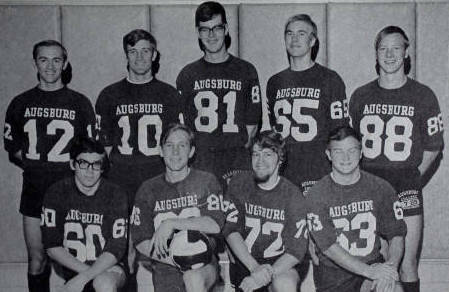 Eriksen returned in 1976 and, with Agre as his assistant, coached six more years, including the 1980 conference championship campaign, Augsburg’s fourth in eight seasons. In the 22 years following Eriksen’s 1981 departure, Augsburg totaled just 29 conference victories. Greg Holker, an all-conference player and two-year assistant coach at Gustavus, arrived in 2004 and guided the Auggies to the 2006 MIAC playoffs while earning the first of his two Coach of the Year awards (2010). Augsburg earned its first-ever NCAA tournament berth in 2008 and won twice to reach the Sweet Sixteen. The Auggies returned to the NCAAs in 2010 and advanced to the second round. This sure was a historic moment for the team and for the fans who witnessed it. Such matches aren’t the ones that should be missed, epsecially if you call yourself a fan. For the true fans out there, tickets and more at Ticket4Football.com are available round the clock. Augsburg surged into last year’s conference playoffs by defeating 2015 NCAA qualifier St. Olaf and upending previously undefeated St. Thomas in the regular-season finale. The No. 6 seed Auggies won at third-seeded Gustavus before a 1-0 overtime loss to St. Thomas in the MIAC semifinals. Coaching longevity is a tradition at St. John’s, where Jim Smith’s 51 years as the basketball coach was surpassed by football coach John Gagliardi’s six decades at the helm. 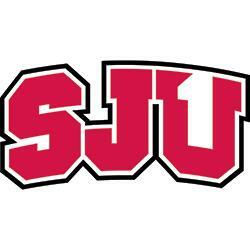 Both of those legendary coaches also served as Johnnies athletic director, which resulted in Smith’s hiring of 1972 graduate Pat Haws as swimming and diving coach in 1973 and Gagliardi’s selection of Haws as the soccer coach in 1978 following just one season as Pete Rocheford’s assistant. Haws ended up coaching soccer for 32 years, swimming and diving for 26, and tennis (1974-1981) and golf (1982-1983) for another decade combined. Despite limited coaching experience and few athletic achievements — “In high school, I played football on the bench, wrestled on my back, and pole vaulted on the ground,” reads his SJU coaching bio — Haws quickly constructed a MIAC juggernaut. Beginning with the undefeated 1979 championship season, the Johnnies won or shared six conference titles and finished second five times through 1989, compiling a 90-9-15 MIAC record. The 1986 team finished 9-0 in the MIAC and earned the conference’s first NCAA tournament victory, 1-0 over Wisconsin-Whitewater, before falling 1-0 to eventual runner-up University of California-San Diego. Following a MIAC playoff championship in 2005 and his seventh conference title the following year, Haws departed after the 2009 season and was succeeded by one of his former players — his son and 10-year assistant coach, John Haws. The younger Haws led St. John’s to consecutive MIAC playoff finals in 2013 and 2014, and last year’s tournament semifinal appearance was the fifth straight for the Johnnies. Returning in 2017 are all-conference midfielder Zack Boerjan, a junior from East Ridge, and senior midfielder Daniel Bruckbauer, an honorable mention selection. Also, back for his sixth season as reserve team coach is Pat Haws. Concordia won consecutive MIAC titles in 1995 and 1996, and made its only conference tournament in 2010. Returning for sixth-year coach Ben Schneweis after an all-conference honorable mention season is junior defender Austin Peterson. Bethel won its only conference championship in 1981 and made its lone MIAC tournament appearance in 2004. The team recorded its first winning season in over four years in 2016 with a 9-8-1 record. All-conference forward Joshua de la Rosa, a junior, returns for seventh-year coach Jeremy Iwaszkowiec. Regular FiftyFive.One readers may be familiar with Iwaszkowiec from his work as an assistant coach with the National Premier Soccer League’s Minneapolis City SC. Sixth-year coach Alex Morawiecki played for Hamline’s 2005 MIAC tournament team, then led the 2015 Pipers to their first postseason appearance since a runner-up finish in 2006. Leading returners include All-MIAC defender Oscar Campbell, a senior from Minneapolis South; and honorable mention picks Jay Reardon, a senior defender; and Adam King, a sophomore forward. Coming off an 8-9-1 record in 2016, senior all-conference honorable mention selections Jared Wolt (Farmington) and Sean Butcher return. The team hopes for a better conference record this season under first-year St. Mary’s coach Corbin Bowers. St. Mary’s went 3-6-1 in MIAC play last season.